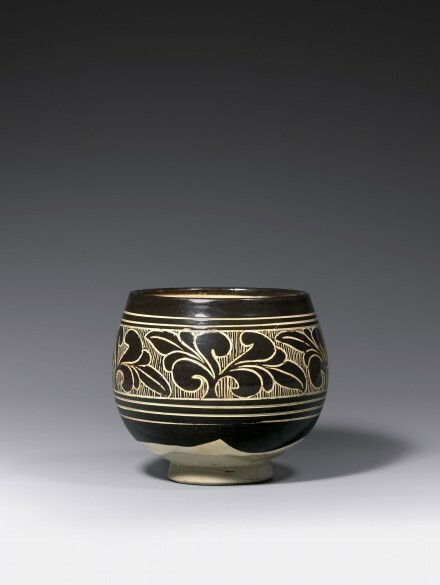 of deep rounded form, decorated with a broad frieze of five stylized leafy sprays on a background of vertical striations framed by horizontal line borders, all boldly carved through the very dark brown-black glaze to the creamy-white slip underneath, the dark glaze continuing over the slightly in-curved rim of the wide mouth, the interior covered with white slip, and with a transparent glaze inside and out, the glazes ending in wide arcs sweeping low on the rounded base, supported on a thick ring foot, the base and foot left unglazed exposing the gray stoneware. A ‘black- and white’-glazed Cizhou deep bowl of this distinctive shape carved with a design of foliate sprays and small florettes on a plain white ground in the Metropolitan Museum of Art is illustrated by Mino in Freedom of Clay and Brush Through Seven Centuries in Northern China: Tzu-chou Type Wares, 960-1600 A.D., Indianapolis, 1980, pp. 110-111, no. 43. Another ‘black- and white’-glazed deep bowl of this type decorated in sgraffiato technique with a wide frieze of diamond-shaped flowerheads in the British Museum, from the Seligman Collection, is illustrated by Ayers, The Seligman Collection of Oriental Art, Vol. II, London, 1964, pl. XXXVIII, no. D-107. The same bowl is illustrated by Wirgin in “Sung Ceramic Designs,” B.M.F.E.A., Bulletin no. 42, Stockholm, 1970, pl. 47-g.